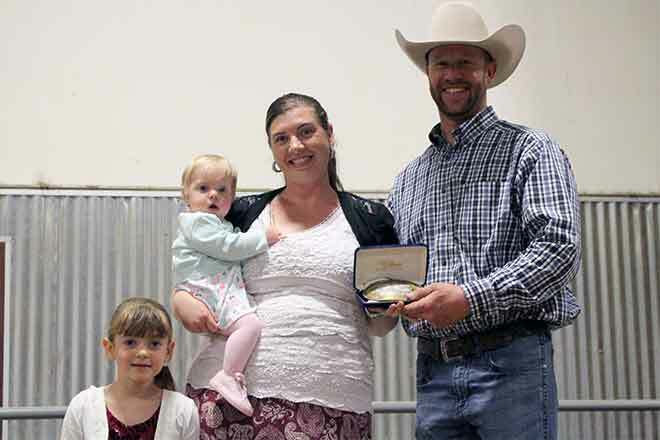 Joined by her daughters, Amber Freouf receives the traveling belt buckle from outgoing president Matt Neuhold to symbolize Freouf’s election as new president of Bent-Prowers Cattle & Horse Growers Association. The cattlemen’s group, which serves Bent, Baca, Crowley, Kiowa, Otero and Prowers counties, is kicking off its 150th year. Courtesy Susan Russell.